Each card is hand-printed at Noyo Print Works from original carved letterpress linoleum blocks to raise awareness of the realities of the animal agricultural industry. Each card is a unique original, created with love on mostly recycled paper and envelopes, and packaged in compostable plastic slips. 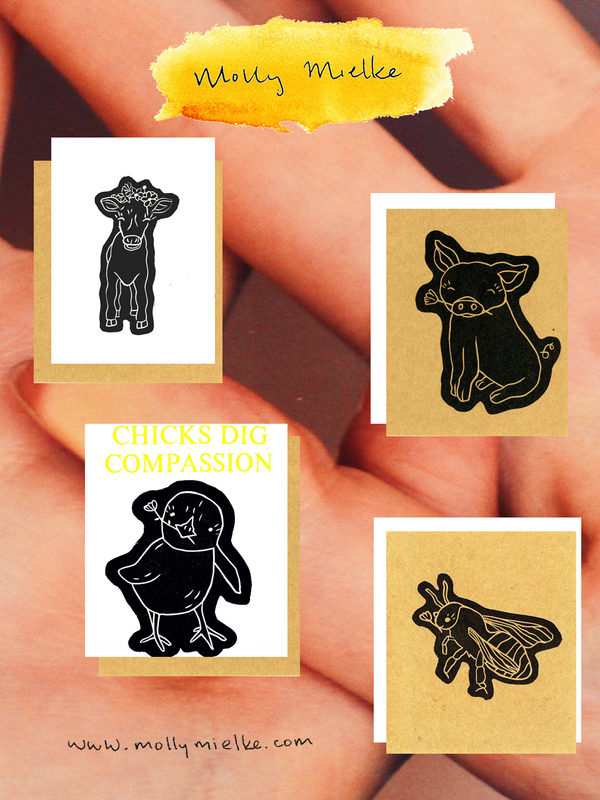 In addition, Luna the Calf, Scarlett the Piggie, Gwinn the Chick and Phoebe the Bee each include a small slip to inspire and educate on the topic of animal rights. Each sale supports my continued education of cinematography at NYU Tisch School of the Arts. Currently Luna, Scarlett, Gwinn and Phoebe are all in stock and ready to be sent with love and compassion! Email me at m@mollymielke.com to place your order or for answers to any of your questions. Sending love and light from foggy Northern California.